One easily applied remedy to the jog in a Fair Isle type of situation is: When you are through with a color, break the wool - even though you may want that color again in a few rounds. Those ends are very useful to hide the jog: darn in the final end down and to the left. Darn in the beginning end up and to the right. But what if you are knitting a color pattern, like hearts or leaves? If you do nothing, your first stitch will travel through the motif, and one side will be higher than the other. 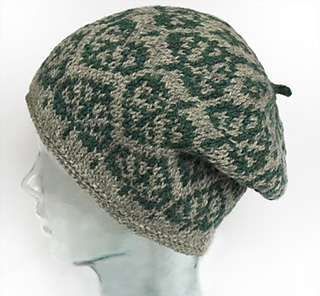 In order to avoid the jog within the motif, you need to work to the right or left of each motif (placing the first stitch of the round in the space between motifs).